How do you feel about traveling on a rainy day? Does not sound too inviting, does it? But the people behind Rainy Day Travel think that this is great name for a program that is supposed to provide you with the best travel options. Of course, we would only have an issue with the name if this program really worked as it is supposed to. Unfortunately, we hate to break it down to you, but this application is an adware program, and it does not care about giving you traveling tips at all. Unless you remove Rainy Day Travel from your computer, you will soon be flooded with annoying notifications and pop-ups, mostly of commercial nature. In a way, we cannot really blame this program for it, because this is exactly what adware does. It tries to make money for its developers by displaying commercial content, hoping the users click it. For instance, if you click any of the pop-ups that you encounter via Rainy Day Travel, each of your clicks will have a monetary value because adware developers make money via the pay-per-click system. It is not an illegal system, and quite a few websites maintain their service fees by providing space for online ads. However, the system itself is very shaky and highly unstable because there is no way to ensure its security. Is Rainy Day Travel trying to expose you to malicious websites? Not really. The program itself does not care where you will land when you click its ads. The programs from this group maintain in their Privacy Policies that they may work with third-party partners, and all the data collected about your browsing habits could be shared with those partners. From there, the program washes its hands off any responsibility lest you get infected. You could probably say that this program is a malicious infection itself because it entered your computer uninvited. Here, we would like to point out the fact that Rainy Day Travel does not need to trick you to enter your computer. Users often install this application willingly even if they do not realize it. 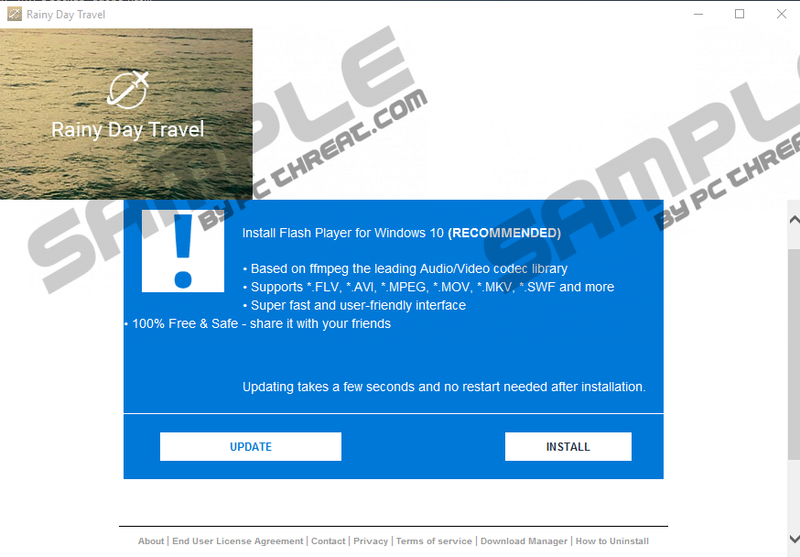 For example, you may download the application from rainydaytravel.com, after you stumble upon this website, or you get redirected to it via another pop-up on some random website. Another way to install the application is to download it bundled with freeware from a third-party file hosting site. Whichever way it might be, the point is that these adware programs require your permission to enter your system. You give that permission yourself. Clicking the Install button on such a notification would not help you upgrade your Flash player. Well, perhaps you may get a specific Flash version, but it would also come with multiple additional applications, and some of them might as well be malware programs. As you can probably tell, these are just few of the reasons you should remove this application from your PC. Not to mention that the program does not live up to its promises and users often do not even want to keep, it so why bother? Delete this application via Control Panel and then check the list of installed programs for other potentially unwanted intruders. If you cannot tell which programs might be potentially harmful, scan your PC with a computer security tool of your choice. In fact, investing in a legitimate antispyware application would be your best bet in this situation because it would help you protect your system from harm in the future. Should you need any further assistance with adware removal, or if you have more questions about computer security in general, feel free to leave us a comment. We are open to feedback and discussions. Select Uninstall a program and remove the adware application. Access Add or remove programs and uninstall the adware application. Quick & tested solution for Rainy Day Travel removal.